“One-One-One” at DAG. Photography by Val Adamson. Editor’s note: The JOMBA! 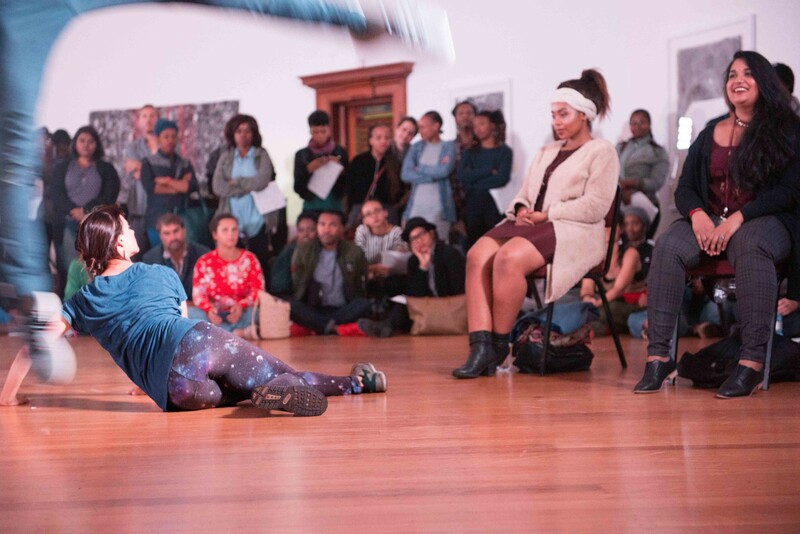 Contemporary Dance Experience left the friendly confines of the Elizabeth Sneddon Theatre Friday for a roaming performance at the Durban Art Gallery at City Hall. Dubbed JOMBA! @ DAG, students in the JOMBA! dance writing residency were tasked with describing their experiences witnessing five immersive works scattered throughout DAG’s galleries. Visitors were permitted to wander between performances, coming and going as they pleased, giving our students the opportunity to “choose their own adventures.” Here are some of their observations of two of the works, “One-One-One” by Ioannis Mandafounis and Emilia Giudicelli, and “Locked” by Jabu Siphika and Zinhle Nzama. As I sat in the ‘hot-seat’ in the Durban Art Gallery’s circular gallery, I was asked my name. “Saranya” I said. I followed his eyes as he rolled himself around the railing of the well, ran around the circular room and reached out to me with one hand as he encircled me and leaped towards me. Then I came to realize that in fact I was feeling quite awkward. It felt like Ioannis was reading my life through my eyes. Freaky much?! The title of this work, “One-One-One,” performed by Ioannis Mandafounis and Emilia Giudicelli (Switzerland), is a one-on-one conversation through eye-contact with the spectator. This work did not need to be in any particular space and the dancers just picked a seemingly random spot. I rushed out of gallery two into gallery four to find a front row seat (which was on the floor) for “Locked,” choreographed by Flatfoot’s Jabu Siphika and Zinhle Nzama with invited guest performers. This women-orientated work takes its starting point in relation to the life of a woman who was asked to get married at the age of 14 to a man she did not know. She refused and this meant she had to be imprisoned in her own home for the rest of her life, locked in and having to slave over the stove preparing food for her family, not bothering about caring for herself. Ropes tied around knees and mouth represented entrapment. Projections of eggs being thrown on the ground and being trampled upon and potatoes rolling down a slope were in stark contrast to eggs being boiled and potatoes being peeled throughout the piece. Was this perhaps a way of showing a wasted life? As I moved to Gallery 4, I stepped into a room with two women each tied on a black block with white rope at their knees and mouths. On the floor were two girls covered with green blankets. There was also a mother figure who was boiling potatoes and eggs on a two plate stove, and a black block with eggshells. This was a poignant piece speaking about how a mother forced her daughter into marriage because she had “come of age” (at age 14!). A vocalist wove the concept of the piece together well with her immaculate vocal range. This work, “Locked,” was created choreographed by Jabu Siphika and Zinhle Nzama featuring invite guest performers (Durban, South Africa). “Locked” at DAG. Photography by Val Adamson. “Locked” was a very touching and painful piece resembling our African struggle of poverty in the context of abuse toward women and girls, whereby children are sent out to marry at a very young age because of poverty in many families — maybe this man promises to feed their families, or promises to pay a lobola. This was a very painful piece for me, in how the choreographers Jabu Siphika and Zinhle Nzama wrapped themselves in rope, representing restriction. Basically you don’t have much of a say about your own body — the body is political — because you are a black young girl and are not granted a voice, therefore you have no rights or no say, when your mother sells you, when they “trade” you for money. You now become a commodity in terms of feeding the family. You now become subjected to this kind of abuse whereby you are deprived of education and love. 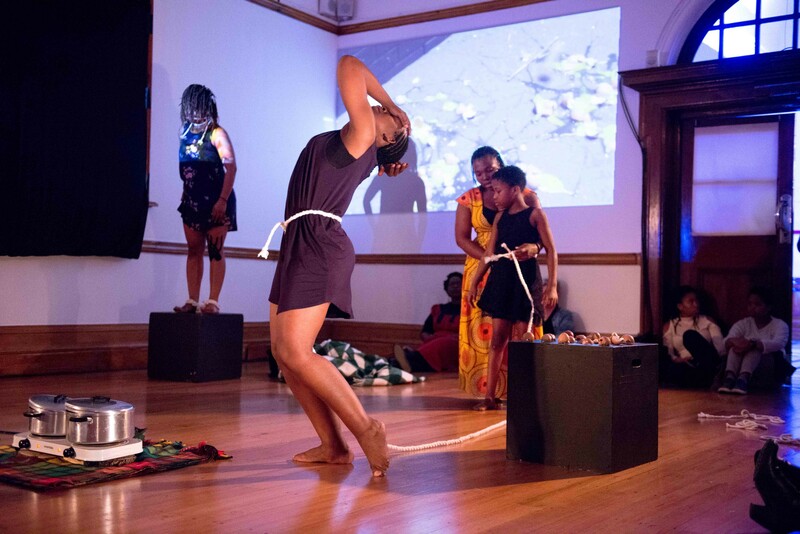 This message is demonstrated through the dancers’ bodies, who utilized their body as a language to convey the message and their bodies as political platform. The installation performance set the space up as a kitchen, an unlikely performance space. The piece describes poverty, and our political struggle, as our women are oppressed by the “bread winner”, oppressed by a man taking us at a very young age. This piece interrogates and provokes; this type of art is not meant to be entertainment, but asks us to engage emotionally and intellectually. It provokes you to say something. “One-One-One” disrupts the space of an audience member as the two dancers put two audience members on two chairs as they keep on moving around while keeping eye contact. The piece reminds you of how we don’t often look at each other’s eyes, so it seems and feels awkward a bit weird. Sometimes we end up getting angry at the person who’s busy staring at you. At the same time, no one was forced to sit on the chair: that idea of causing discomfort — what happens if someone invades your space? Do you react at that moment or you just let them be. “Locked” was a very emotional piece with beautiful harmonic vocal accompaniment. It tells struggles of a black woman in a patriarchal society, in which women raise children on their own while their men go to work in urban areas, and come back once, sometimes twice, a year; and the differences between how women and men are taught when growing up. One of topics that was raised in the piece was forced marriages and forced love (Ukuthwala). Through images of eggs, what came to mind was: the life of a woman is fragile like an egg. It needs to be cherished and handled with love, kindness and careful support. The first performance of the night was titled “One-One-One,” a concept and choreography by Ioannis Mandafounis (Geneva, Switzerland) danced by Mandafounis and Emilia Guidicelli. We walked into the circular gallery, two chairs in front of them as they stand to greet us as we walk in and ask if anyone is willing to volunteer to sit. I was hesitant at first, because I am not sure what to expect and hoping I don’t have to dance, but made myself available. Guidicelli introduced herself as I sat on the chair and I was asked to relax, keep eye contact, and stand whenever I’m ready stand up. Steadily bracing myself for the unknown, the eye-locked Guidicelli stepped back then started moving. My mind at this point was heavy traffic, wondering and trying to decipher the information it was seeing. Do I stand up now? Think! No, don’t think, look! She moved fluidly, alternating in jumps, pacing and runs. Her movement was sometimes constricted and abrasive, at times delicate and elongated. The traffic in my head came to a halt. It is as if a switch has been turned off and I am able to block out the fact that I’m in a room full of people looking at my chosen partner Guidicelli, while our eyes are fixed on each other while she continues to dance. My spirit eases to her as if she has opened a window and the sun is coming in, her movements become a reflection of me. Telling a story, she is talking in a language that is not verbal, but I can understand. It is as if she is reading the lines on the palm of my hands, and I feel my energy swirling within me. I’m immovable from the chair, no walls, no music, and surrender to this feeling. Each movement I am now able to translate into meaning, she stops in dead stares every now again as if to turn a page. Mind blown, I’m filled and trying to make sense of it all. It was more than a performance, for me it was a spiritual journey. A telling, divine and intense, nothing I’ve ever done before but will encourage anyone to experience.